As you begin your search for a property manger, you will most likely notice that there is a large pool of agents to choose from. We are often asked what sets us apart for the others. At Windermere Property Management, we believe it is a balanced combination of strong integrity, quality customer service and a unique customized marketing plan. The perfect recipe to lease your property in a timely manner, maintained with quality and returned to you in excellent condition. For Lease sign in front of property with agent contact info. 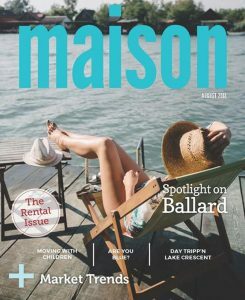 In addition to the above mentioned marketing tools, I put out a digital lifestyle magazine every month geared toward renters. 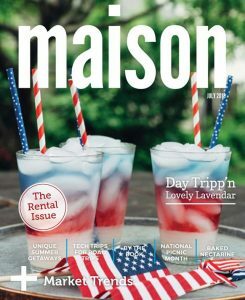 Maison Magazine – The Rental Issue contains tips and tricks for decorating small spaces, highlights various communities in our great state, as well as features my current rental listings. 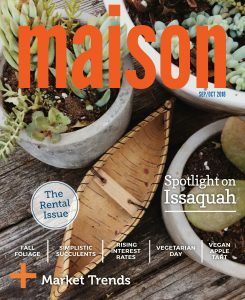 I email this publication to my database of 7,000+ renters, and advertise it on Facebook each month with a targeted ad. Utilizing the power of social media and the ease of forwarding digital material, this additional marketing garners my listings more views than any other property manager can offer.